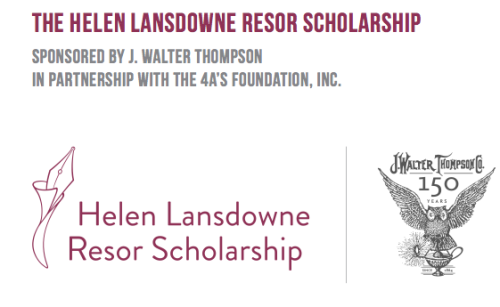 The international Helen Lansdowne Resor (HLR) Scholarship in USA supports and promotes talented female creative advertising students from around the world in honor of the industry’s first female copywriter, Helen Lansdowne Resor. The program will run through 2020. All applications must be submitted before Thursday June 15th, 2017. Each year, the HLR Scholarship seeks to award five female creative students scholarships up to $10,000. In addition, each recipient will receive a paid summer internship at a J. Walter Thompson office in her respective region, an offer of a J. Walter Thompson mentor and “first look” placement consideration upon graduation. This scholarship in USA is available to pursue undergraduate studies. The application should include the following documents and submitted online (the online submission portal can be found at the official website below). For more information and to apply, visit the official website. All the information about International Helen Lansdowne Resor Scholarship has been delivered nicely; talented Students who are eager to pursue their Free Tuition/Scholarships/Study in USA, can apply now. We hope you like this Information. Kindly use the share buttons, Like and send button to share and send this post to your friend. They will surely appreciate it. Note: We are not recruiters, instead we just sharing available Scholarships and Jobs round the world, once you click on the Apply / Job title, it will direct you to the career page of concerned Scholarships and Job provider. So Free Scholarships, Financial Aid And UAE Jobs is not directly or indirectly involve in any stage of Scholarships Offer or Recruitment. Are you Confused? Feel free to ask. Your feedback is highly appreciated. We will try to reply to your queries as soon as possible. Drop in Your Comments, Problems, Suggestions, Praises BUT DON'T Spam. Enjoy!!. THANKS. Free Scholarships, Aids And UAE Jobs, Copyright 2018.. Powered by Blogger.